Take a boat tour of Niagara Falls, zero distance to feel the magnificent and waterfalls of Niagara Falls. Guests will be picked up in New York and New Jersey in the early morning. 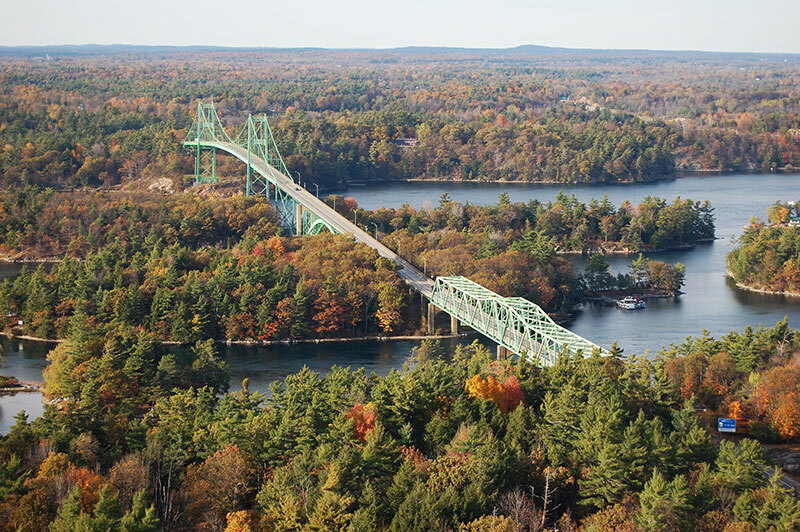 From there we will travel north to the Thousand Islands (U.S. side) where we will take a Cruise Tour of the area. 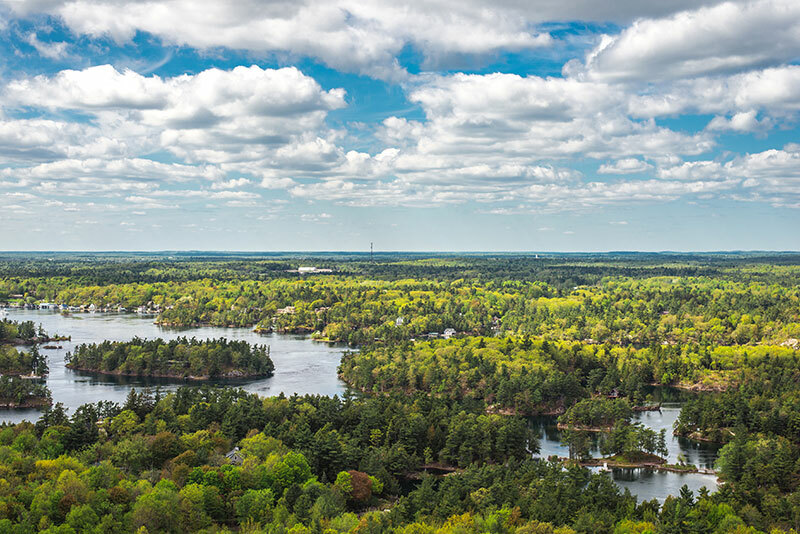 As the name indicated, the Thousand Islands constitute an archipelago of 1,864 islands that straddles the Canada-U.S. border in the Saint Lawrence River as it emerges from the northeast corner of Lake Ontario. 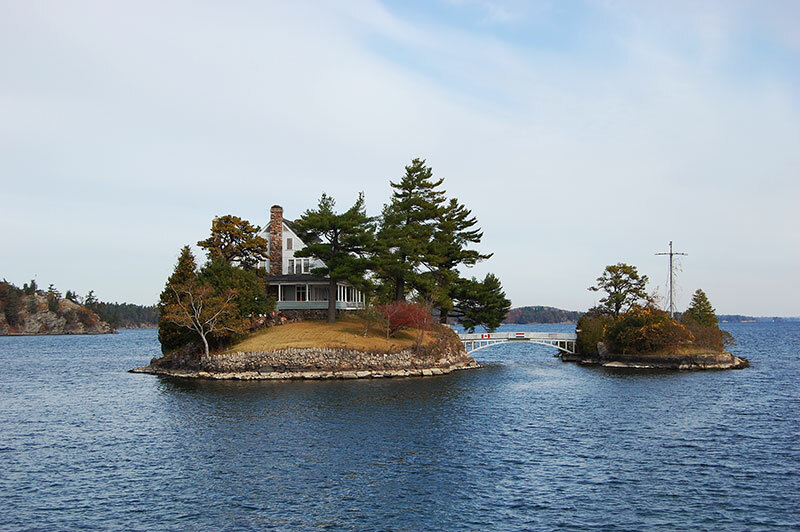 In addition to taking in the scenery, passengers on boat tours can learn of the history of the region, which was once home to pirates and bootleggers, and enjoy views of some famous spots along the way such as the mysterious Deer Island, and the famous Boldt Castle mansion on Heart Island. Also, we will see a “shortest international bridge in the world” on Zavikon Island. 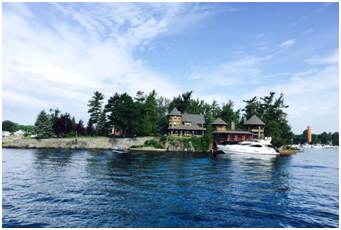 During winter schedule, when thousand islands cruise closed for the season, this tour will go to Secret Cavern, located in upstate New York. A 103-step staircase with various layers of limestone deposited faithfully by the prehistoric ocean is the only way in or out. Many of the caverns in this area were formed largely during the last Ice Age about 38,000-14,000 years ago. “For thousands of years mineral laden water has been precipitating on the walls, ceiling, and floor of the caverns, leaving behind great deposits of golden calcite. When these deposits hang from the ceiling like icicles, they are called stalactites. When they build up from the floor, they are called stalagmites. And when you see calcite dripping down over the walls or covering the rocks, that is called flowstone. ” – You will have a wonderful time with all the views mentioned! After dinner, we will back to hotel for rest in the evening. Departure from the hotel in the morning, we will go to explore Niagara Falls, NY where we will take Niagara Falls In-depth Tour and take the famous Maid of the Mist boat ride (closed in winter and will be replaced by Jet Boat). Afterwards, we will go back to the pick-up points in New York in the evening. 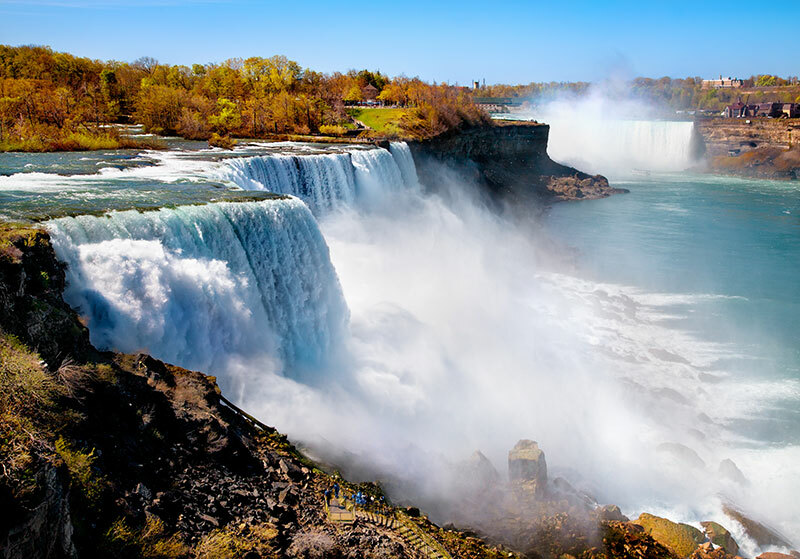 Niagara Falls In-Depth Tour - This interesting and exciting tour includes two popular attractions: the magnificent natural wonder - Niagara Whirlpool State Park and the U.S. historic landmark - Old Fort Niagara. The Niagara Whirlpool’s greatest depth is 125 feet. It is estimated the whirlpool formed approximately 4,200 years ago by the upstream erosion of the Niagara escarpment by Niagara River. Old Fort Niagara is a rich historic landmark; it spans more than 300 years. Its commanding presence on the great lake caused it to play a critical role in the French and Indian War, the American Revolution and the War of 1812. The gorgeous Lake Ontario lies behind the Fort. 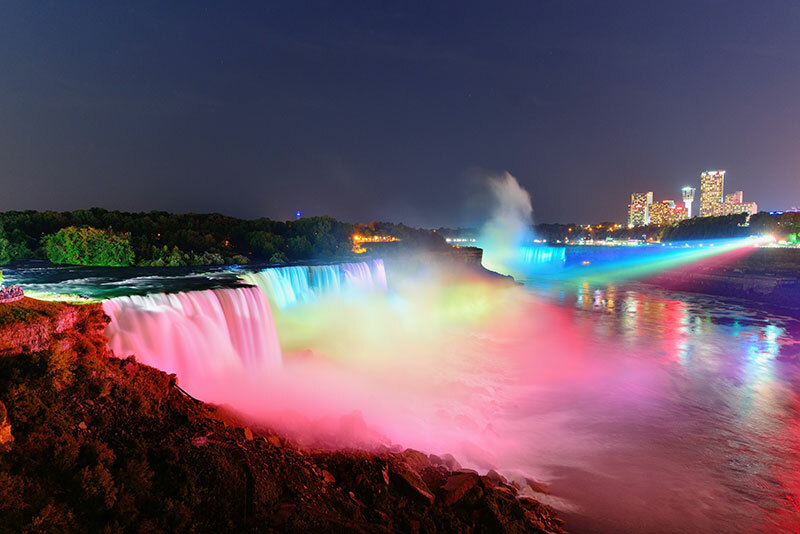 During November to May of next year, you can optionally watch a Niagara IMAX movie, which chronicles more than 12,000 years of history and examines human interaction with the falls from ancient time through the people - like you - who come to see them today. (Summer Schedule: April-Oct, 2016) Maid of the Mist - It’s the combination of height and volume that makes Niagara Falls so beautiful. More than 6 million cubic ft. (168,000 cubic meters) of water goes over the crest line of the falls every minute during peak daytime tourist hours. This famous Maid of the Mist ride gets passengers as close as possible to the Niagara Falls! The Maid rides right into the mists thrown up by the roaring cascade as the Niagara River tumbles over the edge of the falls. Multiple departure locations are provided as a convenience options for all traveler during this tour trip. Please note that you may transfer to central meeting point from the multiple departure locations prior to departure on your trip.